(Photo submitted) HARMONY: The Travelling Mabels — (left to right) Eva Levesque, Lana Floen, Keith Floen and Suzanne Levesque — will be performing in Vauxhall at the Jets Stadium on Sept. 9. In their debut Vauxhall performance, the Travelling Mabels will be singing for the fences. The Travelling Mabels are a country/folk group who began performing together eight years ago. While all four are from Alberta, they didn’t start singing together until one night in Winnipeg, eight years ago. Suzanne Levesque had been nominated for the Association of Country Music in Alberta’s Bass Player of the Year award, and she and Lana Floen had travelled to Winnipeg together, where they met up with Suzanne’s mom, Eva Levesque. “We were all friends prior to, sort of. We were musical friends,” said Lana, guitar player and singer in the Travelling Mabels. Joined by Keith Floen, their music naturally lends itself to storytelling, working in with their different musical backgrounds and experiences. Since the group’s founding, they have been named the 2011 Group Of The Year by the CCMA, and have toured throughout Canada, performing and telling stories. “We do a variety, because we know our audiences like variety. And we all came from different musical paths,” said Lana. 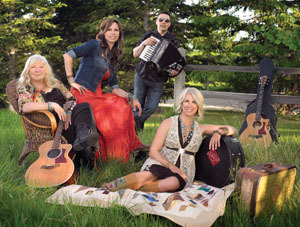 The group consists of four members; Eva (Mama Mabel) on vocals and guitar, Lana (Purdy Mabel) on vocals and guitar, Suzanne (Baby Mabel) on vocals and bass and Keith (Unstable Mabel) on piano, accordion and accompaniment. “Apparently, I’m ‘Unstable Mabel’. Perhaps well earned, who knows,” added Keith with a laugh. The group knows Taberite Corbie Dorner, who will be opening for them during their debut Vauxhall performance. Keith and Dorner had worked together doing piano work in Calgary, so when Dorner’s uncle was working on organizing the event, they all agreed that Dorner would open. “(Dorner’s) a wonderful, talented artist in his own right,” said Keith. The Travelling Mabels will be in Vauxhall on Sept. 9 at 7 p.m., where they will be performing at Jets Stadium. In addition to covers of songs everyone knows and loves, they will be featuring songs off their latest album ‘Postcards’, which is available online and on iTunes. “The love of the music, really it’s just something you have,” said Lana. “It’s looking out and seeing their faces and that connection,” said Keith, on performing. “Especially with each of them being a storyteller, when you can connect with people and see they’re relating, they’re going along on the ride with you, that’s first and foremost. If you love great songs with superb female vocal harmonies, then this debut CD should be in your collection. Eva Levesque, daughter Suzanne and friend Lana Floen share most of the writing credits along with lead and harmony vocals that blend perfectly, creating a very smooth flowing sound on every track. Ian Tyson himself adds his raspy vocals briefly (along with the ladies) on a wonderful song penned by Pat Hatherly and Jim Lewis. The resulting Alberta Blue is definitely a highlight track on the disc. Any fan of Linda Ronstadt, Emmylou Harris and Dolly Pardon's collaborations should enjoy this Alberta grown trio. Three Canadian lasses gather very talented musical friends and put out a first album, ripe with tight and beautiful harmonies, excellent musical arrangement and a sense of humor in songs reflecting their lives and experiences. “Smolder Blues,” for instants comically laments maturity forcing the singer to smolder, not burn. Many other tunes are about relationships and “Alberta Blue” is a tantalizing love song to their native Canada. Very easy on the ears, and good for all mixes. I’d call it Americana but these gals is Canadian! Red Deer, AB – The 2011 Association of Country Music in Alberta Awards was hosted in Red Deer this past weekend at Westerner Park. Several awards and recognitions were handed out to some of the best in Alberta’s up and coming country music scene. With over 200 artists, industry members, and fans alike in attendance for the 1st Annual gala – the country music scene was apparent! “We are privileged to have such a unique foundation of country artists in the province ranging from folk and bluegrass to country rock. As an Association, this was our opportunity to showcase these artists to industry members as well as fans throughout Alberta,” says ACMA and Royalty Records President, Rob Smith. Following the awards show, guests were invited to a jam session hosted by Alberta’s own KixxSin which showcased the other award nominee’s. A special thank you to 2011 CCMA Group of the Year, Hey Romeo, who hosted the evenings show, as well as, a big thank you to our presenting sponsor: Ranchman’s Cookhouse & Dancehall Inc. and our other show sponsors: Westerner Park, Travelodge Red Deer, Live Events Concerts & Promotions, Exposure Productions, Rayacom Print & Design and Andrew Peller. For more information, we invite you to visit our website at www.abcountrymusic.ca or ‘like’ our page on Facebook. Our mission: To develop, nurture and promote Alberta Country Music and its Artists and to support the Alberta Country Music Industry and its Alberta based companies to the best of our ability. Hello, Mable. They named the act after a hound dog — one of those Blue Suede Heelers. But the Travelling Mables are no rockabilly act. More Emmylou than Elvis. More like the Travelling Wilburys — you know, if they were girls. The mother, daughter and best-friend act sang a smart, sunshiney opening set on Saturday. I call them Matthew and the Mables, but that’s another story. With this early praise, the Mabels kept practicing and writing original songs, and had their eponymous first album out by June. The Travelling Mabels drew on their varied influences such as Emmy Lou Harris, Dolly Parton, Patsy Cline, early Sheryl Crow and Sweethearts of the Rodeo. With their vocal harmonies and instrumental abilities, they were able to pen eleven tracks with a few focusing on the blues. “Eva wrote them, but they’re about other people’s blues – we don’t get the blues!” laugh the Mabels. Also on the album is a guest appearance by Ian Tyson. Lana and Ian share a common bond: Lana’s husband, who functioned as Tyson’s keyboard player. I have been invited to forward a letter of what I can only call “awesomeness” for ‘The Travelling Mabels’. They had played in our community a week ago and folks are still talking about them and how much they felt that this had to be one of the best concerts they had ever seen in the 23 years of our existence as a concert series. Many folk commented that we needed to bring them back next year, if possible, and these sorts of requests do not come lightly but with a deep conviction of what they saw and experienced on stage. Their music is true to Alberta, true to the prairies, and with a reality that harmony, humour, and musical professionalism is what draws crowds into their world and into their realm of touching hearts wherever they perform. I would never hesitate to have them grace any of your stages and have your fans leave with a feeling that they’ve been touched with something much greater than what could be expressed in word. They are fabulous, fun, real, and more importantly, know how to bring music into every heart – into every soul. The Travelling Mabels are truly on the go and truly on the move! You will be delighted!